Dog Walking With a Difference! 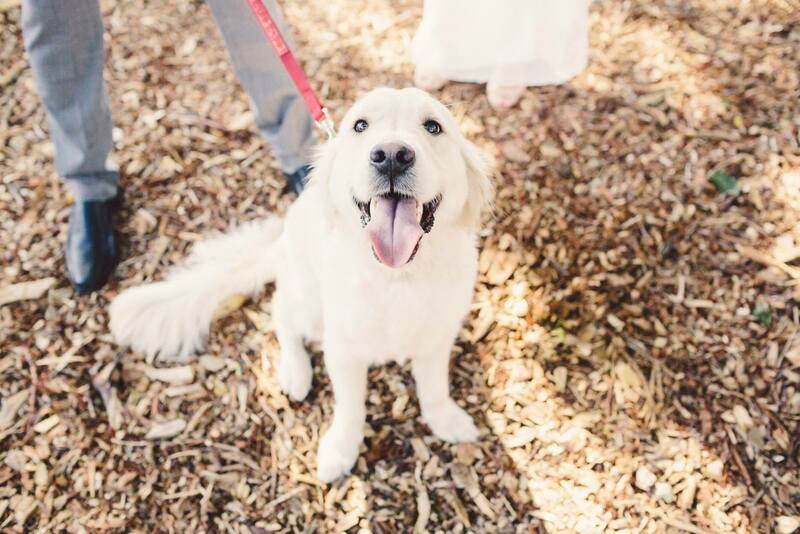 “I’d like my dog to be at my wedding – well at least for some of the photos”. That was the request that came to Lisa and then to me as a SPOT walker a few weeks ago. Would I be available to be their dog’s wedding attendant, to collect their dog from home, drive her to New Farm Park where she could be included in photographs with the bride and groom and then taken home for dinner and bed? “That sounds like fun”, I thought. So off I went on the set date, collected Milly, an adorable Golden Retriever and headed off to New Farm Park. It was a very warm Saturday afternoon and the park was packed. When the bride and groom arrived with the photographer, I handed Milly to them for the photos and observed from a short distance. Milly appeared to love every minute of her role and it seemed that she knew what a special event this was. She came back to me when all photos had been taken. By now, many of the observers in the park were both interested and curious. Milly became the centre of attention and just lapped it up. Milly at the Wedding – from an onlookers perspective! Milly was resplendant in her off white wedding outfit – her hair was highlighted by the golden sunlight and one could only see her as a worthy addition to the wedding party. Her owners were proud of her attention during the photographs and her walker thought that at not yet 2 yrs old she was certainly a star of the day – the bride and groom equally commended her behaviour and were so delighted with their canine companion.